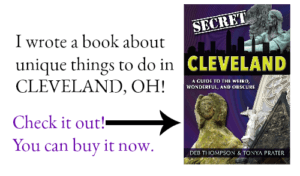 When my family set out from our home in Ohio to travel parts of Route 66 on our way to California several years ago, I had one goal in mind. To see as many roadside attractions as I could possibly see in two weeks. My children, on the other hand, had a very different goal; to reach California in record time. Since family travel is all about compromise, our trip became a strange Route 66/Interstate mix. 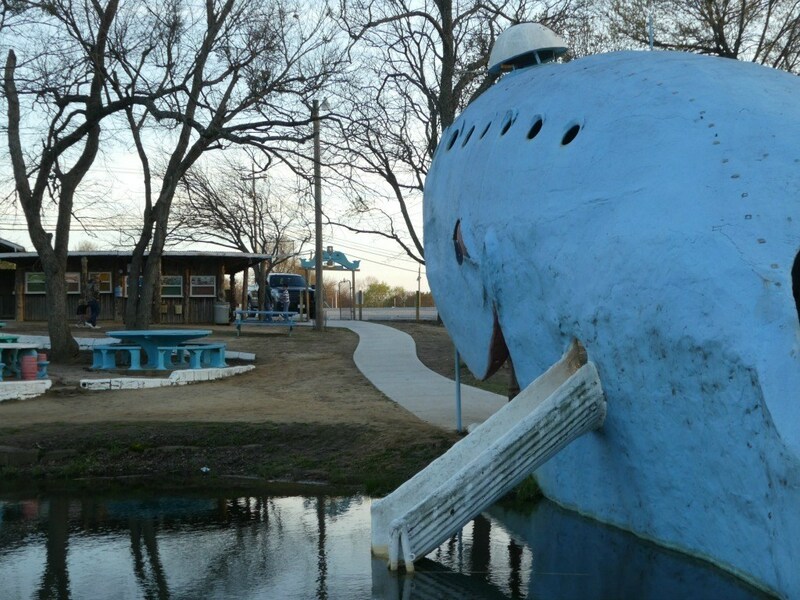 On a recent solo trip to Tulsa, I finally managed to mark the whale off my ever-growing list of must-see roadside attractions. The site did not disappoint and now ranks with one of my all-time favorite roadside attractions. 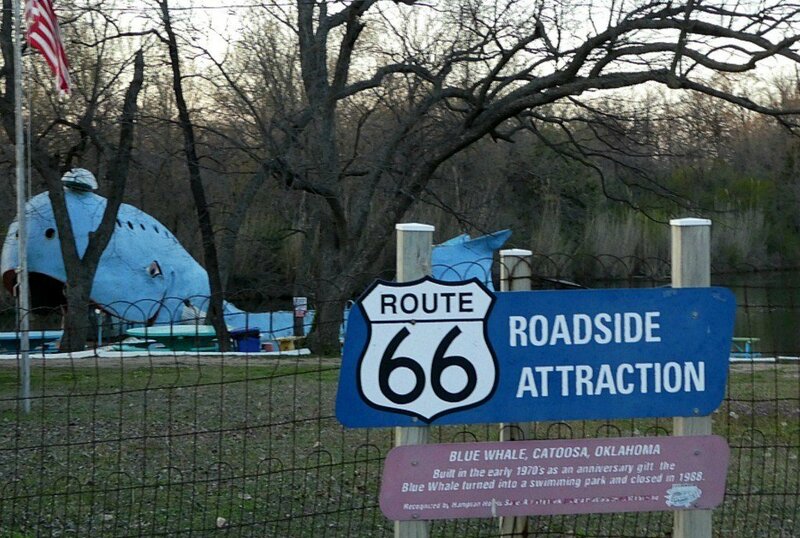 The Blue Whale of Catoosa is located east of the small town of Catoosa on Route 66 and about 20 minutes from downtown Tulsa. Keep your eyes out for the Blue Whale on the left side of the road as some visitors have expressed that it’s easy to pass. The attraction is open from dawn to dusk, but even if you arrive a bit later and find the gate locked, you can still get a glimpse of the whale through the fence. Construction started on this iconic Route 66 tourist attraction in 1970 by Hugh Davis. A zoologist and former director at the Tulsa Zoo, Davis was passionate about sharing his love of animals with the community. Davis had built an attraction prior to constructing the whale which served as the Animal Reptile Kingdom or A.R.K. complete with a snake pit. These two attractions remain on the property and while you’re welcome to take photos from afar, exploring the ark is forbidden. “Blue” as the whale is affectionately dubbed by locals, measures 20-feet tall and 80-feet long. 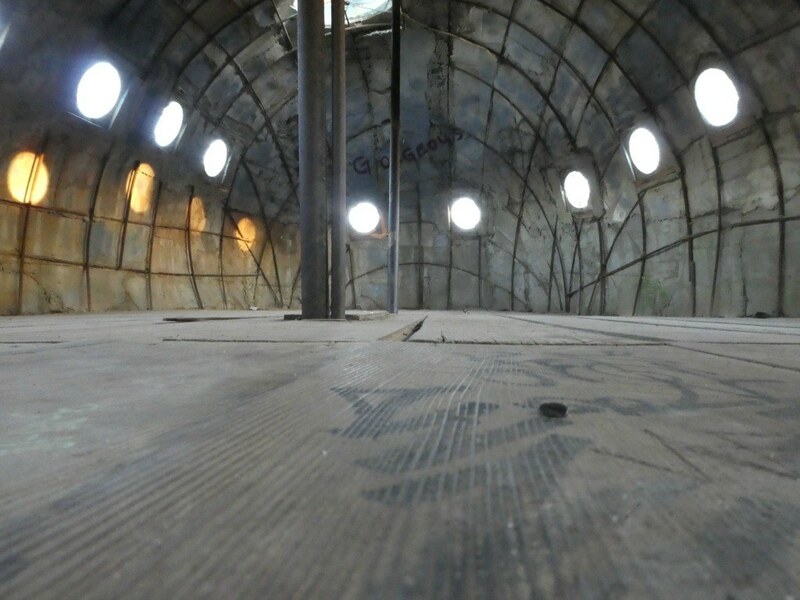 It was constructed from an iron skeleton that took a friend, Harold Thomas, 100 hours to weld and concrete which took Davis nearly 3,000 hours to apply one five-gallon bucket at a time. The total cost for the whale that took two years to complete, is estimated to just under $2000. The whale was completed in 1972 and presented to Davis’ wife Zelta as a 34th anniversary present. 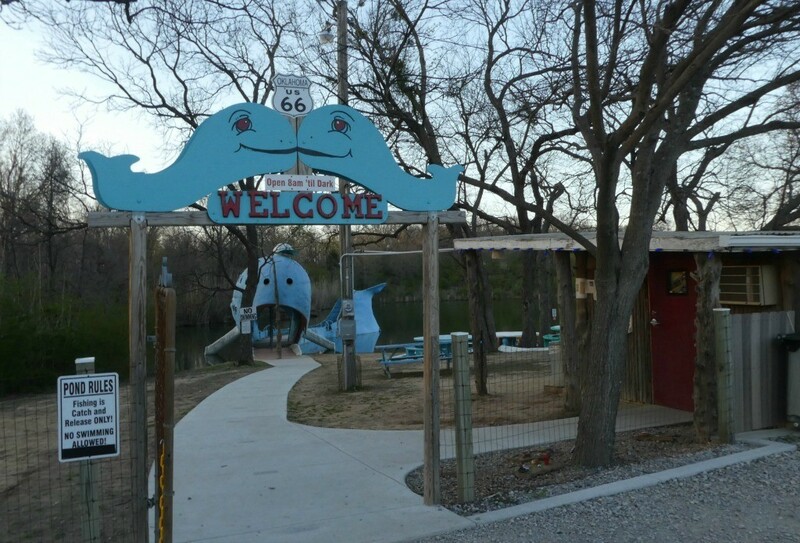 Initially intended for family, the whale’s popularity was wide-spread and it quickly became an attraction for the general public to swim, picnic and fish. Due to liability issues, swimming is no longer permitted, but individuals and families are welcome to picnic and fish (catch and release) on the grounds. 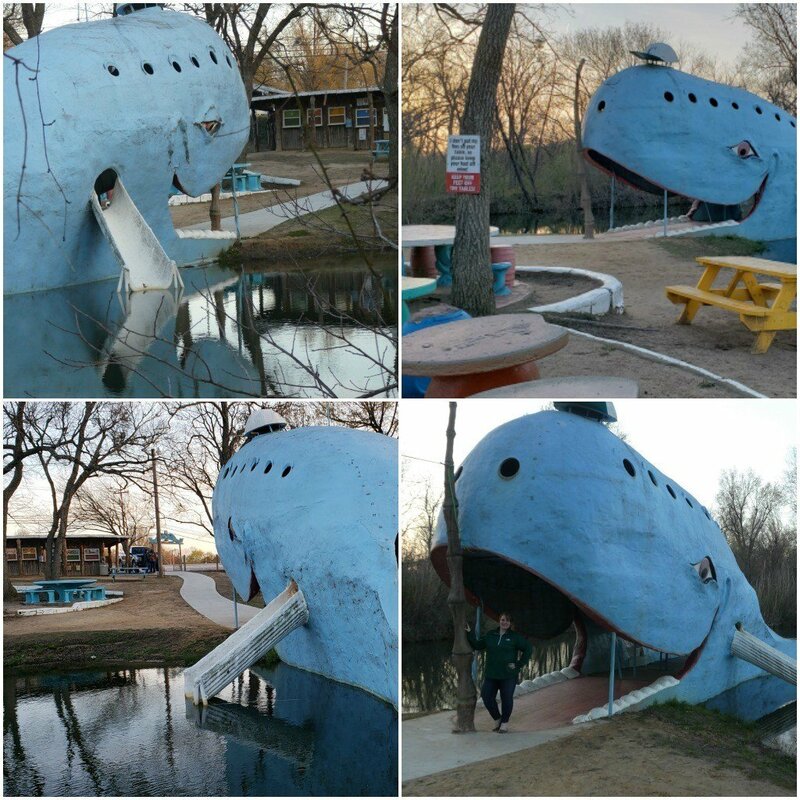 After Hugh and Zelta passed away, the whale full into disrepair and a target for vandals. With the aid from the community, it has been restored to its former glory. 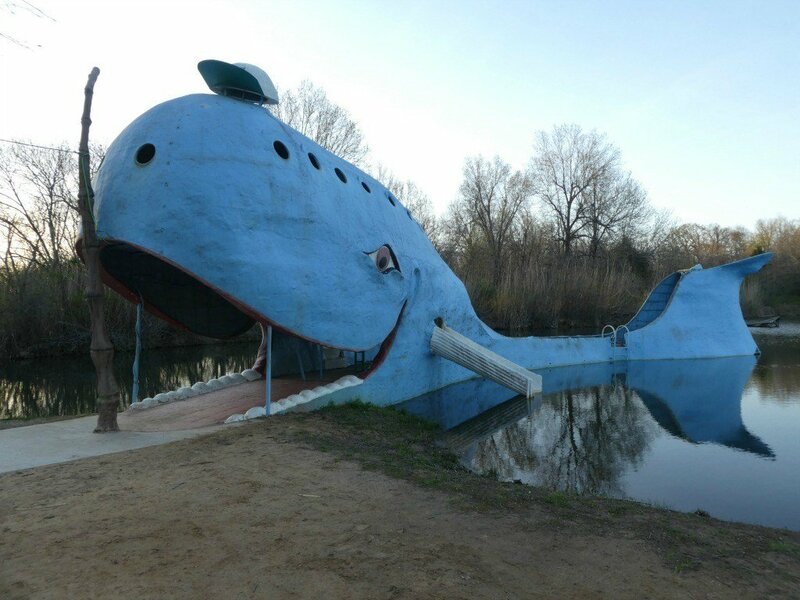 The whale is owned and maintained by Dee Dee Belt, the Davis’ daughter. A small concessionaire on site sells postcards, patches, pins, stickers, t-shirts and other fun souvenirs. 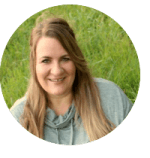 You can learn more about the history of Blue here. Admission to the whale is free, but you may want to consider supporting Blue by leaving a donation or purchasing a souvenir or two in the gift shop. It won’t take longer than 15 minutes to stop for a photo op, but there’s no need to rush off. Cast concrete picnic tables are plentiful. 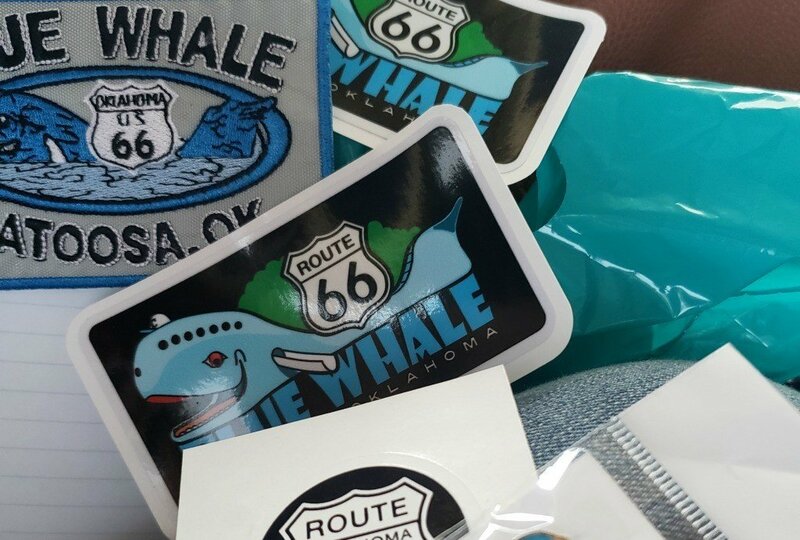 You can enjoy a picnic, especially if you’re road tripping along Route 66, and a short nature trail on the left side of the whale is worth exploring to allow a view of the whale that most don’t see- and a great angle for a photo! Parking isn’t a problem for oversized vehicles. 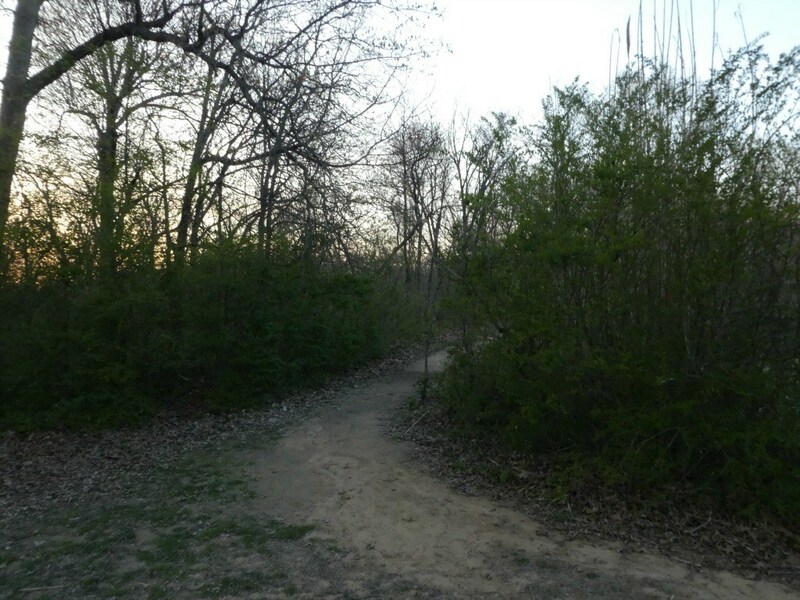 You’ll find a large parking lot that can accommodate RV’s and even a commercial tour bus or two. 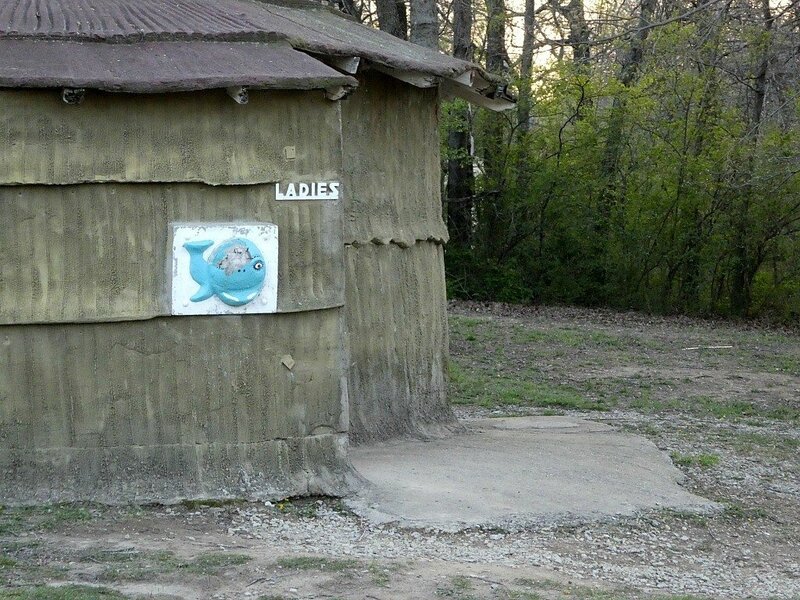 Restrooms are available on the property. 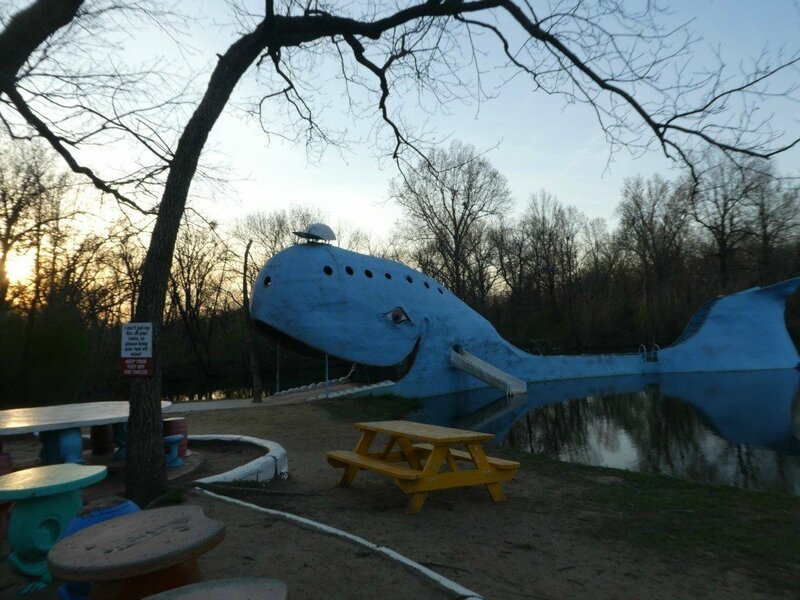 Have you been to the Blue Whale of Catoosa?